Please be aware your health is your own responsibility. You need to check with your medical doctor before following any advice provided in the back pain forum or make use of the information in the self treatment program. SLM Bodywork (SLM) is the publisher of information for educational purposes only. SLM itself does not employ licensed medical practitioners, nurses, dieticians or nutritionists. SLM is not affiliated with any medical institution and its representatives are not licensed Medical Practitioners. 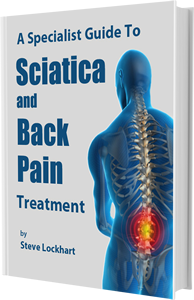 The Self Treatment Program for Back Pain and Sciatica Sufferers: SLM publishes materials under the title “Self Treatment Program for Sciatica and Back Pain Sufferers” which includes a DVD, a book or guide, and personal support from Steve Lockhart. These three components make up the “Program” and all components are offered subject to this disclaimer. Neither the Program nor the Program materials or content have been approved by the Therapeutic Goods Administration in Australia, any national body or Government agency. You understand that the Program support services are not designed or intended to offer emergency medical care or response services. SLM’s Program offers general information about maintaining a healthy body and covers the types of exercises which are genuinely believed to assist in the relief of back pain. However, each person is unique and the information included in the Program may not be appropriate for your specific health or back condition. SLM does not give medical advice or opinions on medical conditions, treatments or cures; and you should not rely upon anything in the Program or Program materials as a preventive, cure or treatment for any purposes. Any information in the Program, Program materials or the back pain forum that appears in the form of an opinion, recommendation, preventive, cure or treatment should NOT be taken as medical or other advice even if it may appear to you as such. SLM strongly recommends that you check with a licensed physician who is familiar with the details of your particular back condition before you begin using the Program or the Program materials. Content and Currency: SLM provides the program and program materials “as is” without warranty of any kind, either expressed or implied, including, but not limited to, the implied warranties of merchantability, fitness for a particular purpose, or non-infringement. SLM makes no warranties about the accuracy, reliability, completeness, or timeliness of the program or program materials or services, website, text, illustrations or graphics. SLM does not warrant that its program website will operate error-free or that its program website and its server are free of computer viruses or other harmful mechanisms. If your use of the program website or program materials results in the need for servicing or replacing equipment or data, SLM is not responsible for those costs. Your responsibility: Your health is your responsibility. Your use of the Program is your choice and will be at your own risk. The program and program materials are not intended to offer you all information about maintaining a healthy body and back. There are many options and alternative courses of action that may be equally or more beneficial to you. Depending upon your specific back condition and health situation, the Program and Program materials may be detrimental to your health. Exploring all of the options and alternatives is your responsibility. The Program and Program materials include illustrations and demonstrations of how to perform certain exercises that may involve common items such as a tennis ball or rubber ball, and that may also include the use of other equipment or items. You are responsible for the condition and your use of all these materials should you decide to incorporate them into a routine of your choosing. SLM does not endorse any particular equipment or other items. Descriptions of, or references to, products or publications does not imply endorsement of that product or publication. The content of all advertisements appearing in the Program materials is the sole responsibility of the company placing the ad. SLM does not endorse either the accuracy or reliability of the content of the advertisements, or of any products connected therewith. Limitation of Liability: SLM and its parent, subsidiary and affiliated companies and their respective directors, officers, employees, advisors, agents, licensors, and other contributors will not be liable for any injury, harm or death you or others may suffer as a result of the use or attempted use of the Program or any materials in the Program or equipment or machines incorporated into the Program, whether or not such use is in accordance with all Program instructions or other directions. SLM will not be liable for any indirect, consequential, special, incidental or punitive damages related to the Program or Program materials or any errors or omissions related thereto. SLM maximum liability for any claim based upon the Program or Program materials is limited to the retail price of the Program as of the date of publication of the version or edition.